This lesson shows you some examples on solving linear equations. These examples will help in your understanding on this topic. This lesson is a continuation from Part 1 for this topic. After learning the basic concepts behind solving linear equations, it is time to take a look at some examples to understand these concepts better. Remember that when we solve a linear equation, whatever terms that are added to one side of the equation, the same terms must be added to the other side of the equation. This is important to keep the equation balanced. Notice that, we put brackets around all the terms to both sides of the equation. By doing so, the equation will remain balanced. Notice that, we need put brackets around all the terms to both sides of the equation. By doing so, the equation can remain balanced. Solving Linear Equations (Part 2) from MathExpression.com on Vimeo. This lesson shows you some examples on solving linear equations. To solve a linear equation, our objective is to find what value x is equals to. Now, Let's solve, 2x -1 = 5 + 4x. Since our objective is to find what is x equals to. we need to put all the terms with x, on on one side of the equation, usually, on the Left hand side. We can do so by removing +4x. To do so, we add -4x to both sides of the equation. The equation now becomes 2x -1 -4x = 5. Now, notice that we also need to remove negative 1? To do so, we add +1 to both sides of the equation. The equation becomes 2x -4x = 5 + 1. Alright, we now add the like terms together. Adding 2x with -4x gives -2x. Adding 5 with 1 gives 6. Now, notice that to find x, we need to remove -2 from -2x. Finally, we can solve for x by dividing +6 with -2. This gives x = -3. Next example on solving linear equations, let's solve 2(2x -1) = 2x +8. First, we need to remove the brackets. 2 multiply by 2x gives +4x. 2 multiply by -1 gives negative 2. Now, let's put these terms back into the equation. 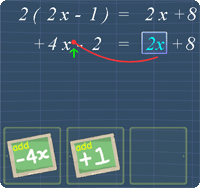 Now, we can remove 2x by adding -2x to both sides of the equation. This gives +4x -2 -2x = +8. Now, we can remove -2 by adding +2, to both sides of the equation. This gives +4x -2x = +8 + 2. We can simply this equation by adding 4x and -2x . This gives +2x. Now, add +8 with +2. This gives +10. To find x, we need to remove +2 from +2x. We can do so by dividing both sides of the equation by +2. The equation becomes x = +10/+2. Now, we divide +10 with +2. This gives 5. So, the answer is x = 5. Next example on solving linear equations. Let's solve. 2 (x +1) = 5 – 3(x -1). First, we need to remove the brackets in this equation. Let's start with 2 bracket x+1. 2 multiply by x gives 2x. 2 multiply by +1 gives +2. Let's put these terms back. Now, let's remove the brackets in -3(x -1). -3 multiply by x gives -3x. -3 multiply by -1 gives +3. Let's put these terms back. Now, we need to remove -3x from the Right Hand Side. To do so, we add +3x to both sides of the equation. By doing so, the equation becomes 2x +2 +3x = 5 +3. We can remove +2 by adding -2 to both sides of the equation. The equation now becomes 2x +3x = 5 +3 -2. 3 minus 2 gives 1. 5 plus 1 gives 6. Now, to get x, we need to remove +5. We can do so by dividing +5 to both sides of the equation. This gives, x = +6 / +5. Now, since 6 divides by 5 is not an integer, we can leave the answer in the form of fraction. So, the answer is x = 6/5. Final example on solving linear equations, let's simplify x/4 + 2 = x -1. Now, we can remove +2 by adding -2 to both sides of the equation. The equation now becomes, x/4 = x -1 -2. Now, we can add -1 and -2. This gives -3. It is easier to solve this equation if we remove the denominator, 4, from this equation. We can do so by multiplying both sides of the equation by 4. The equation now becomes x = 4(x -3). Remember to put brackets around the terms when multiplying. To proceed, we need to remove these brackets. 4 multiply by x gives 4x. 4 multiply by -3 gives -12. Let's put back these terms. We can remove 4x by adding both sides of the equation by - 4x. This gives x -4x = -12. Now, we can simplify the equation by adding x with -4x. This gives negative 3x. To get what is x equals to, we need to remove -3 from -3x. To do so, we divide both sides of the equation by -3. The equation now becomes, x = -12/ -3. Dividing -12 with -3 gives 4 . So, the answer is x = 4. That is all for this lesson on on solving linear equations. Try out the practice questions to reinforce your understanding. You can start by going through the series of questions on solving linear equations or pick your choice of question below.